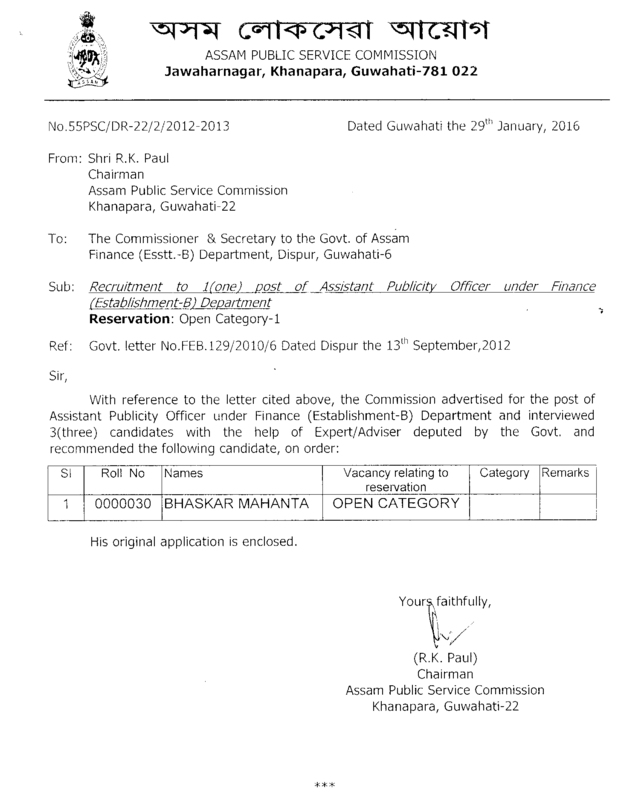 Result: Departmental (Promotion) Examination of the members belonging to the cadre of (i) Assam Accounts Service, (ii) Assam Local Fund Audit Service and (iii) Assam Treasury (Estt.) Service Personnel in Class-I, Grade-III Cadre of Assam Finance Service (Advertisement number 02/2018). Result: Interview/Viva-voce for the post of Inspector of Schools/DEEO/Deputy Director under Education (Secondary) Deptt. 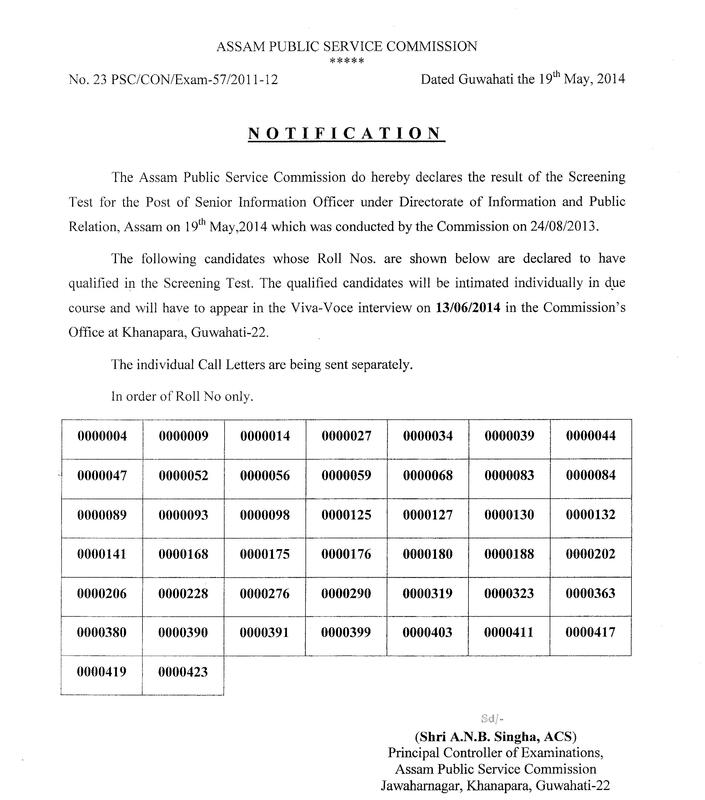 Result: Interview/Viva-Voce for the post of Asstt Professors in Nyaya in K.K. Handique Govt. Sanskrit College, Guwahati under Higher Education Deptt. 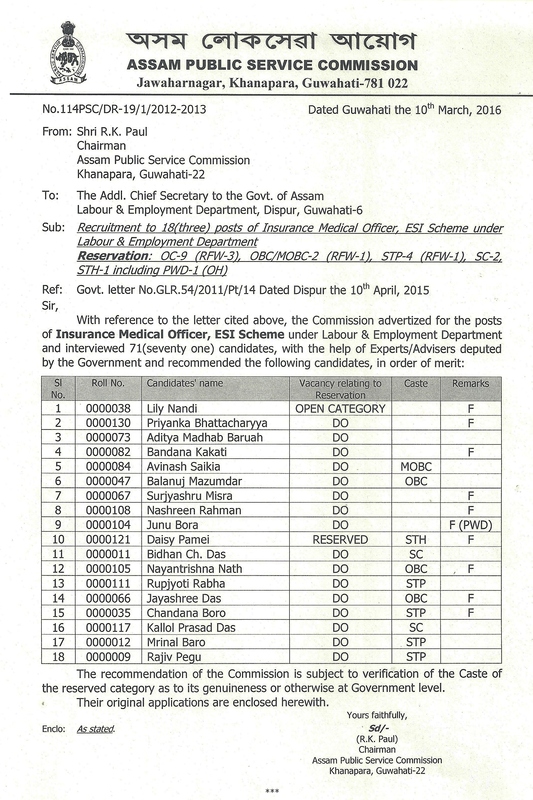 Result: Interview/Viva-Voce for the post of Lecturers, DIETs in the Directorate of SCERT, Assam under Elementary Education Department. Result: Interview/Viva-Voce for the post of Medical Inspector of Factories under Labour Welfare Department. 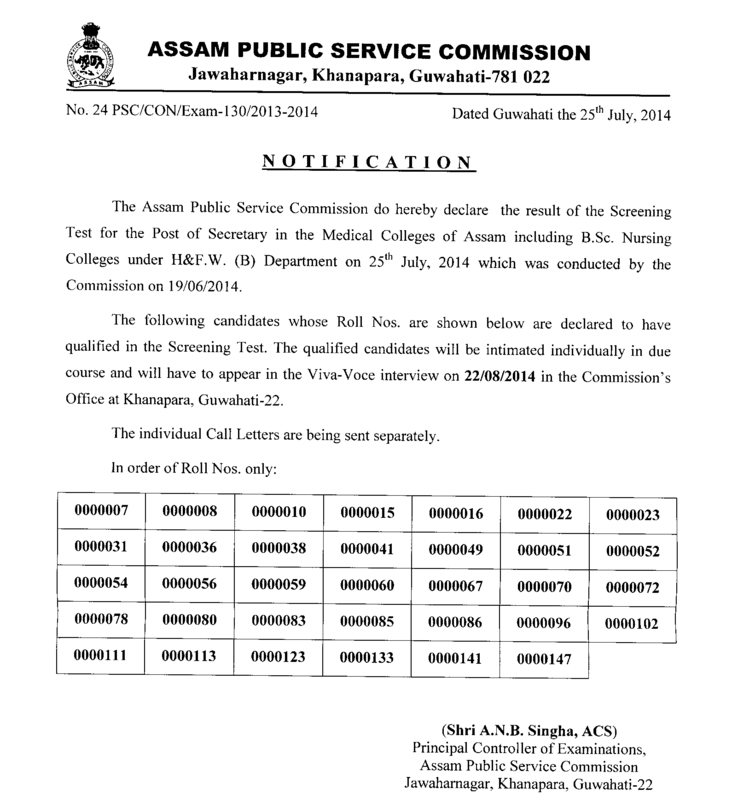 Result: Interview/Viva-Voce for the post of Lecturer under Dr. Bhupen Hazarika Regional Govt. Film & Televisison Institute under Cultural Affairs Department. Result: Interview/Viva-Voce for the post of Distric Museum Officer under Cultural Affairs Deptt. Result: Law Asstt. to Legal Remembrancer & Under Secretary to the Govt. of Assam under Judicial Department. Result: Jr. Engineer (Agriculture) under Agriculture Department. Result: Asstt. Director, T&CP under Urban Development Deptt. Result: Asstt. Manager/Supdt. Of Industries/ Asstt. Industries Officer under Industries & Commerce Deptt. Result: Inspector of Schools/DEEO/Dy. 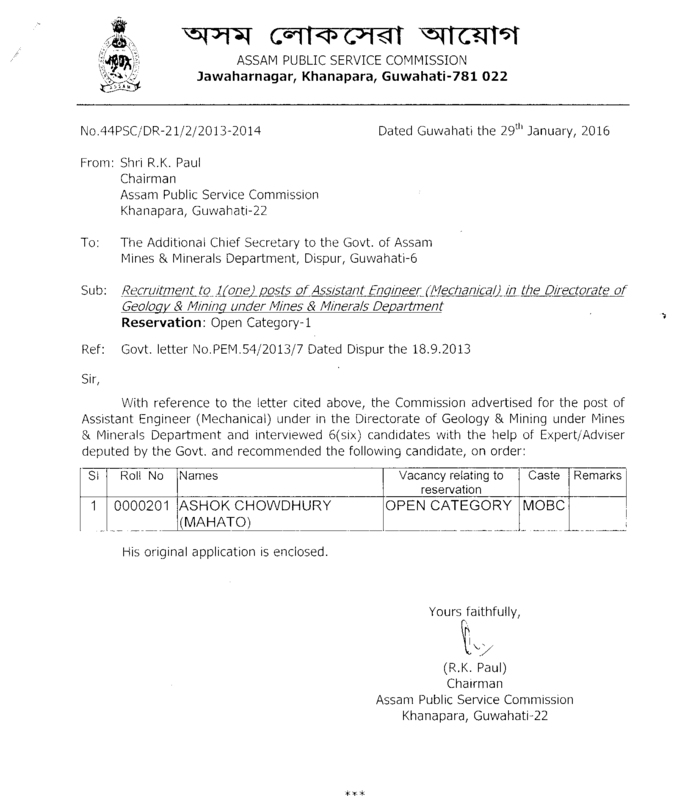 Director under Assam Education Service in the Secondary Education Deptt. Result: Inspector of Factories under Labour & Employment Deptt. 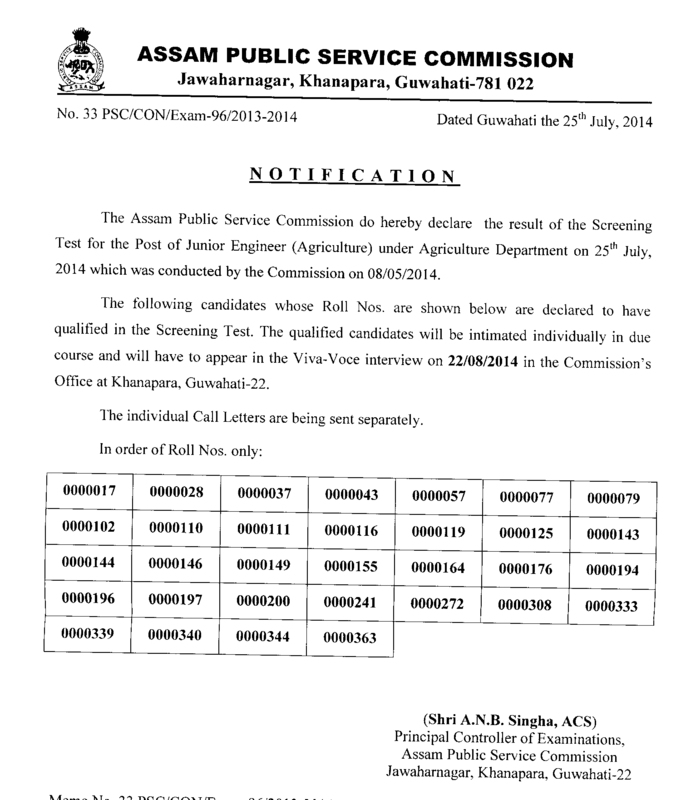 Result: Agricultural Development Officer under Agriculture Department. Result: Superintendent of Handloom Textile under Handloom Textile & Sericulture Deptt. Result: Principal Luit Konwar Rudra Baruah State College of Music under Cultural Affairs Deptt. Result: Chief Language Officers and Language Officers under Legislative Deptt. 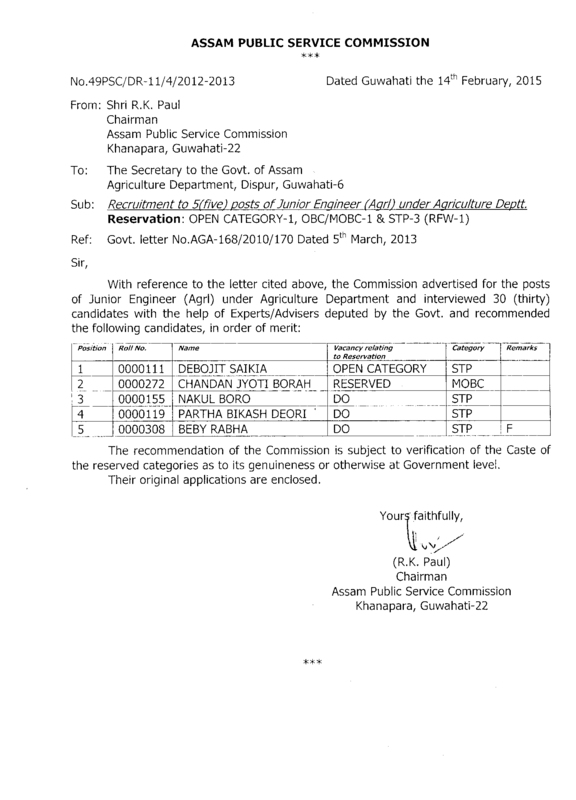 Result: Director of Health Services, Assam and Director of Health Services (FW), Assam under H&FW(A) Deptt. Result: Recruitment to the posts of Electrical Inspector in the Inspectorate of Electricity, Assam under Power (Electricity) Deptt.